I broke out a couple of eggs today (week 3 reward for those who need a reminder of where the eggs came from) and made a nice French toast breakfast with honey-butter as syrup. It wasn't the best French toast in the world but it sure was something different and I thoroughly enjoyed it. Actually, it was quite filling and I was only able to eat half of it. The other half was put into the refrigerator for tomorrow's breakfast. On my way to work this morning I noticed that the air conditioning in my truck was on the fritz again. I just had it recharged the other day! I will have to bring it back to the garage so they can check it out again. I called their office and it looks like I can bring it in tomorrow morning. At my lunch hour today I took advantage of the nice sunny day and checked the bee hive. I was concerned because I have been seeing way too many drones lately and it made me worried that there may not be a queen in the hive. I suited up in the full regalia and opened it up. The bees were pretty docile - I didn't have to use the smoker to calm them down. I opened the hive and checked each individual bar and comb. One of the combs was crooked and was starting to cross over onto the adjacent bar. This is not good but I caught it early enough to take care of it. I removed this comb completely. Hopefully this will force the bees to start a new one on this bar and hopefully the new one will be straight. The comb that I removed was full of nectar and some honey so I took a photo and put it into a zip top bag. Even on such a small comb there is a lot of honey inside. I examined the internal combs for some time looking for signs of the queen. I almost gave up hope until I glanced over and saw a bee that was slightly longer and just ever so slightly different from the rest. I found her! It's a miracle that I could figuratively find the needle in the haystack. In this case the haystack is a continually moving, crawling colony of bees - literally over ten thousand of them - and ONE queen. I was sure of it though. So as soon at I spotted her I figured everything was all right. I closed up the hive and continued my day. For dinner tonight I took advantage of some more lettuce growth in the garden and prepared a nice bowl of salad greens. The asparagus have finally run out. There seems to be a few short, new stalks emerging but nothing to harvest today. It was great while it lasted though. And I am very grateful for the asparagus and for all the nutrients they provided during the past several weeks. This evening it was time for the big fish fry number 2. I had a nice pile of fluke that needed my undivided attention for a few hours. And a few hours is exactly how long it took to get through it all. I vacuum sealed and froze this whole batch minus the bag in the photo. I want to have one out to eat after the SDC. One that was never frozen. 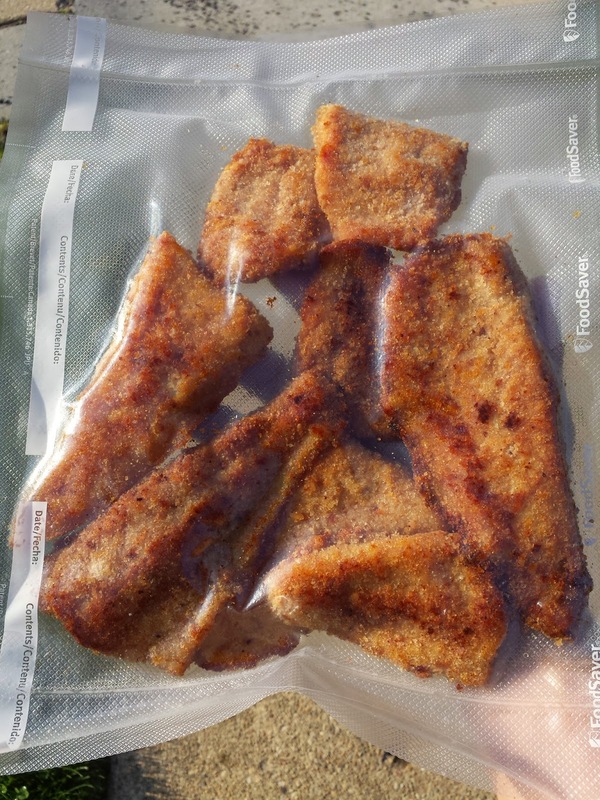 I made about 6 bags just like this one and now I have a good number of cooked, breaded fillets in the freezer for any time I want to have some fluke. It will last here for about a month before starting to 'turn.' I made a big mess out of the kitchen but I also did a good job cleaning as I was cooking so it didn't get too out of control. I made 6 bags like this one! There are only 2 days left! It's a little anticlimactic because after that first week I really haven't had to struggle much at all. I may continue on with it with a few exceptions. Tomorrow I will make my monthly dessert lists for junk food like I did last year. I found that to be very helpful for someone like me who has trouble with moderation. And as usual, I have to come up with a post SDC plan and write it down. I'll be thinking about that a lot in the next few days. It's time to get another blood test to see how my cholesterol numbers are. I will also request a heavy metal test and Vitamin D. I called the doctor today to request a prescription for lab work right after diet is over. No ice cream until the blood work is done! Truck apt for tomorrow am.